Eagle Vail Limo and Vail Transportation Service – We are a National Limousine Association Member with a BBB A+ Rating and in business since 2001. Eagle Vail Express is a Safe, high quality and affordable choice for Vail Limo, Denver to Vail transportation, Aspen Transportation, Vail Airport Shuttle, Vail Taxi and Beaver Creek Limo Services. We have used Eagle Vail Express on many occasions and the company has always provided EXCELLENT service. Even before our last trip, we would not consider any other car service. However, our last trip to Beaver Creek really made us understand just how VITAL a car service is and how much the consumer needs to know about the company. My son was arriving later on 3/2/19, so we engaged EVE to pick him up at Eagle. Because of weather and a series of issues, his flight was cancelled and rescheduled for 3/3/19. Throughout the day on Sunday–and in the face of a historic storm–EVE kept us posted on the progress of the flight and safe/unsafe conditions. My son was so frustrated on Sunday that he wanted to rent a car and drive from Denver (his flight was almost to Eagle and was turned back). The guys at EVE convinced him that driving was treacherous and advised against it. My son finally arrived at about 10pm and EVE was there to meet him and take him safely to Beaver Creek. Thank you EVE–you are the best car service in the country. – Karen S.
3. Matt and Freddie were both punctual, professional and informative on our drives to and from Beaver Creek to the airport in Vail. Freddie got us safely to the airport during heavy snowfall which our family will always be grateful for. I couldn’t have been more pleased with the way our reservations were handled and confirmed. Great staff all the way around. 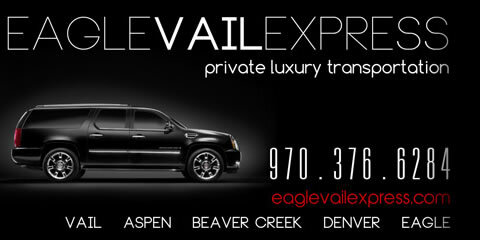 We will definitely recommend Eagle Vail Express to those looking to have driving taken care of by a great team. Our next trip to the area will include a call to Eagle Vail Express for our Vail transportation needs. 5. We are the family you recently transported from Denver to Vail over the president’s week. We were really impressed with your Vail Limo Service and I have sent you some new clients. Look out for the Davis or Klein families. They have a condo in Vail Colorado which they visit quite regularly and will likely be calling you for future service. We hope to visit again soon and will certainly call you if we do. Thanks Again! 7. Very nice job today. We will certainly use you all again for our Vail Transportation as well as recommend you to our friends and business associates.